Trea Bertie scored Racing Club's opener in their 2-2 draw with Chelmsley Town on Tuesday evening. Racing Club’s already slender title chances suffered a further setback as they were held to a 2-2 draw by lowly Chelmsley Town, writes Paul Okey. After a mundane first half, the game exploded into life with four goals in eight second-half minutes. 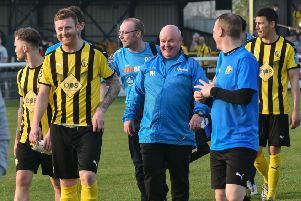 An injury to goalkeeper James Kelly forced the visitors to put outfield player Brad Lindsey in goal and they were then reduced to nine with two yellow cards. However, Racers were unable to take advantage, spurning a number of chances to secure the three points late on. New signing Wade Malley was joined on the bench by Martin Slevin and Jack Taylor as manager Scott Easterlow shuffled his pack ahead of a busy schedule and it resulted in a disjointed opening from the home side. Luke Cole failed to get enough purchase on two efforts before Trea Bertie came closest to breaking the deadlock just short of the half-hour mark, hitting the bar with an overhead kick. A smart turn and first-time shot from Curvin Ellis proved comfortable for Tom Cross in a rare Town threat and Luke Cole was again presented with a decent chance for Racers after picking up a poor Kelly clearance. However, he rolled his shot tamely past the far post. Bertie also failed to hit the target with a shooting chance as the sides went in at the break level. Ten minutes into the second half, Easterlow had seen enough and introduced Slevin in place of Henry Leaver in a bid to add some creativity to his midfield. Four minutes later, however, the home side were behind. Cross had already had a lucky escape when Demi Smickle’s shot from 25 yards bounced awkwardly in front of him and went on to hit a post after the keeper could only get fingertips to it. The resultant corner was well defended but from the follow-up, Smickle sent in a cushioned volley from the edge of the box which looked to be straight at Cross. However, the keeper fumbled the ball over the line, vehemently claiming to have had his view obstructed by an offside player. Racers were quick to respond, with Bertie producing a calm sidefoot finish to dispatch a loose ball in the Town box. Parity lasted less than two minutes, though, with Smickle pouncing on hesitant home defending to slot home from eight yards. The breathless pace of the game refused to let up and Racers substitute Malley was denied by the legs of Kelly after appearing to be pulled back in the act of shooting. Joe Smith then slotted home at the far post from the resultant corner to make it 2-2. Kelly was unable to continue after sustaining an injury in the save from Malley and Lindsey pulled on the gloves to replace him. Cole fired narrowly past the angle from outside the box and then drilled a shot just past the near post as Racers pressed for a winner and their cause was aided when Chelmsley were reduced to ten men following an elbow on Cole. Robert Ellis received a red for a headbutt in the aftermath, with his brother Nicholas walking for the initial challenge. With tensions high on both benches, Malley sidefooted over from a good position and Bertie was put clean through only to scoop his shot over the bar. Malley then fired a free-kick from the edge of the box into the car park as the visitors held on for a point they celebrated as if they had won the league.